$70.00 $70.00 + Free Shipping! 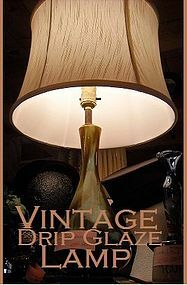 Regular Price: $85.00 This incredible Vintage Drip Glaze Lamp brings the essence of yesterday in your living room or bedroom today. This lamp has been tested for reliability as it remains electrified in our showroom for periods in excess of 6 hours daily. The lamp is free from chips, cracks, and other flaws. If you would like to see additional photos of this item or inquire of its dimensions, please contact us at crossroadantiques@live.com or our manager, Jason, directly at (870) 637-2445.